What to do if your QuickBooks Online (QBO) Invoices are going to your customers’ spam folder | QBPros, Inc.
There’s a new option for sending an invoice within QuickBooks Online (QBO), named “Share Invoice Link“. This function was created to help those users whose invoices ended up in their customers’ spam due to the email being sent through Intuit’s servers instead of their own. With the “Share Invoice Link” function, you can grab a link that you can paste into your own email to send to your customer. When the customer clicks the link, the the invoice will appear the same as if it were sent through Intuit’s server. Since this is done one at a time, it is a manual process, and you will have to type in your own subject and message, and of course paste the link into the message area. 1. 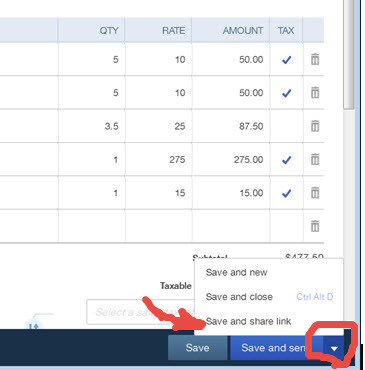 Viewing an Invoice: Click the down arrow on the button named either “Save and Close” or “Save and Send”, and you should see an option for “Save and Share Link”. Then select “Copy and Close”. Finally, paste the link inside of your email. 2. Viewing the Sales Transaction list (ie from Customers): Click the down arrow at the right of the desired transaction row. Select “Share Invoice Link” then Click Copy and Close . Paste link inside of your email.